The Bowflex Max Trainer M5 is the mid-level cardio machine in the very popular series, combining an elliptical trainer and a step machine into one low-impact exerciser. For those looking for a treadmill alternative, the M5 just might fit the bill. UPDATE: In late 2018, the Bowflex Max Trainer M5 was replaced by the all new M6, which is essentially the same machine but with the new Max Intelligence platform. This subscription-based app is similar to iFit Coach found on NordicTrack and ProForm treadmills. It gives you access to customized workouts as short as 4 minutes, workout tracking and sharing, Run Social maps and lots of other great interactive features. Otherwise, the M5 and M6 are nearly identical, so this review still applies. Read on to learn more or visit our Bowflex Max Trainer review page to find out about the entire series. The fact that we are doing Bowflex Max Trainer reviews on a treadmill site goes to show you just how popular these hybrid cardio machines have become. They've eclipsed the popularity of the company's TreadClimbers, and get almost twice the amount searches in Google each month. We've received a ton of questions about these machines, especially the M5, so we figured why not have the team review them to see what they are all about. 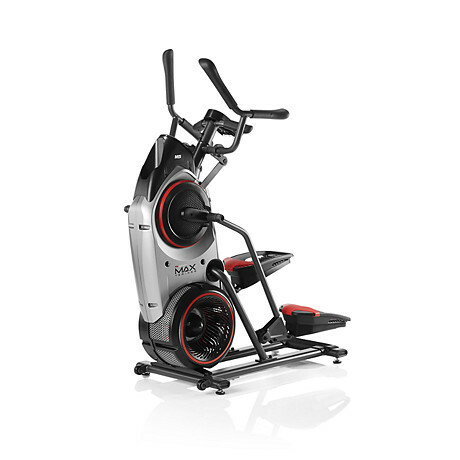 In a nutshell, the Max Trainers are ellipticals and step machines combined. You're walking like you do on the elliptical machine, but you're stepping up as you do so. Just for your reference, the TreadClimbers combine the two with a treadmill belt, so those machines are three machines in one. But getting back to the M5, it and the other two Max Trainers (M3 and M7) offer Bowflex's patented 14-minute Max Interval workout, a series of high intensity and low intensity segments which really ramp up the cardio and give you an effective workout in a shorter amount of time than you need on other machines. In fact, the company claims you can burn up to 2.5x the number of calories per minute on a Max Trainer that you can on other cardio machines including the treadmill. Although we can't be entirely sure that is accurate, assuming that you are moving at the same speed it makes sense that you would be burning more calories adding a stepper element to the upper body elliptical workout. 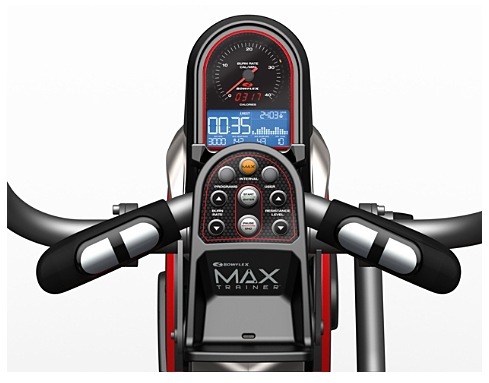 We found the Max Trainer M5 to offer a solid workout. In addition to the 14-minute interval program, which really does make you sweat, there are 7 other built in programs to choose from. You also have 16 levels of resistance, up from 8 on the base M3 model, so you can really challenge yourself from one workout to the next. Bluetooth tracking, also available on the M7 but not the M3, allows you to sync with your favorite fitness programs with the Max Trainer app, so you can track all of your workouts, set goals and challenges for yourself, and share your result with family and friends. Another plus is the compact size, meaning you can fit the M5 easily into any home gym setting. It's only 46" long (half the size of a treadmill) and much lighter, making it easyier to transport from one place to another. Any negatives? The only real issue we have, which is the case with all of the Bowflex Max Trainers, is the fact that the warranty is not so great. You only get 2 years on everything, which compared to the lifetime frame and 2-5 years parts on comparable treadmills and ellipticals is rather paltry. If you do get the M5 it makes sense to add the additional coverage for peace of mind. All in all, the Max Trainer M5 gives you a very good full body, low impact workout. It's a nice step up from the base M3 with more features and capabilities. Although not as advanced and durable as a comparably priced treadmill, the Max Trainer M5 is a solid cardio machine with enough features and capabilities to satisfy most users. It offers a low-impact workout, with a nice amount of resistance levels and workout programs, heart rate monitoring, Bluetooth tracking and a space saving design. As we mentioned, it's the best of the three models, but if budget is a concern take a look at the base M3 model as well. Also check out the M7, which is a bit pricey, but it learns and adapts to meet your needs as you train, something the other two models don't offer. Editor's Note: The M5 has been replaced by the M6; the M7 has been replaced by the M8; the base Max Trainer M3 remains the same.